Have you already checked out my PHOTO BLOG on FindMyMusthave.nl? Go to the website to check out more holiday pictures in Switzerland and must have winter wear! Hi guys, Here a small photo series of my stay in Switzerland. Hope you're enjoying your spring break to the max! Yes guys, I'm still alive! Enjoying my spring break to the max in sunny Switzerland! As you may know, I'm crazy about skiing, the mountains and sun. And don't forget the hot chocolate! However, before I was in Switzerland, I visited one of my dearest friends in Italy, Eleonora. I've met her two and a half years ago when we studied together in Boston. We've got so close in those couple of months that even after that cool experience, we traveled to see each other. Well, it is a bit harder now, because Ele is studying in Shanghai (OMG, so cool), so that's quite a flight.. However, every time we see each other (which is not as often as we would like to) it feels like we saw each other the day before. So cool how friendship last likes this and even gets stronger through the years. Heading back to my outfit (which was shot in Amsterdam obviously). 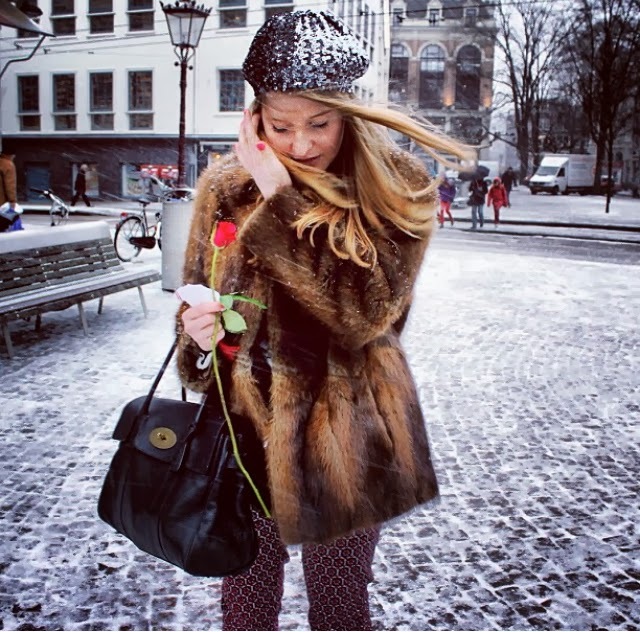 I'm wearing a vintage fur, simple grey top and boots from the Zara, Mulberry bag and Supertrash sequin trousers. As you may know, I'm head over heels with sequins. I got this one at Noah, which is a super fabulous shop located in Oosterbeek (my parents' home town). Every time I get back at my parents' place I cannot wait to see what Noah has in their shop now! You may have seen this sequin trousers here for Christmas dinner. What do you think? Some people may consider it as too much, however, do you think that it is OK to wear sequins during the day? Let me know! ave you already checked out my PHOTO BLOG on FindMyMusthave.nl? Go to the website to check out more pictures. Hi guys, Good news.. We're halfway the week! How did you manage did? ;-) I had a busy week arranging things together with my fellow students organizing a Mojito Party for tonight. Get out of your winter depression and get the summer feeling is the idea. This Friday I will also leave to Milan to see on of my dearest friends! Then I will have a week spring break. I cannot wait! However, I have to study like hell, because I need to resit some exams in the beginning of March. Are you going on Spring Break? Share me your plans! Enjoy your Wednesday! Hi guys! I figured out that I had to do something with my lucky number 13. So I came up with the idea to post once in a while 13 things that are on my mind. Like hot spots, fashion trends or whatsoever. 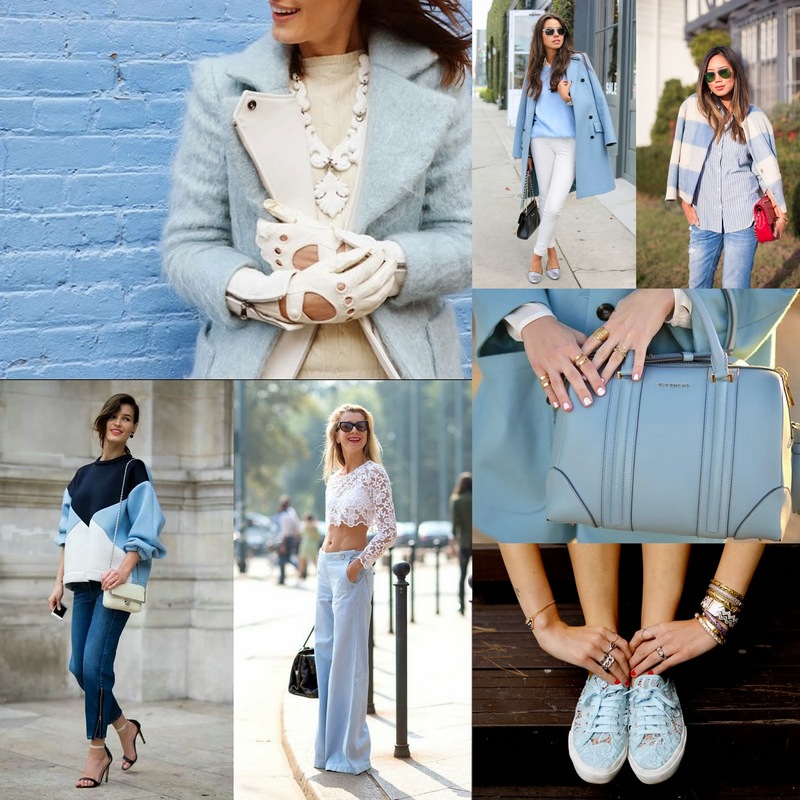 The first post is going to be about a trend for the new season; baby blue. I love this trend so much (especially the Zara faux leather jacket and Givenchy bag). However, with my skin as pale as Snowwhite, I am not sure if it would suit me.. What do you think about this trend? Let met know! How cool! 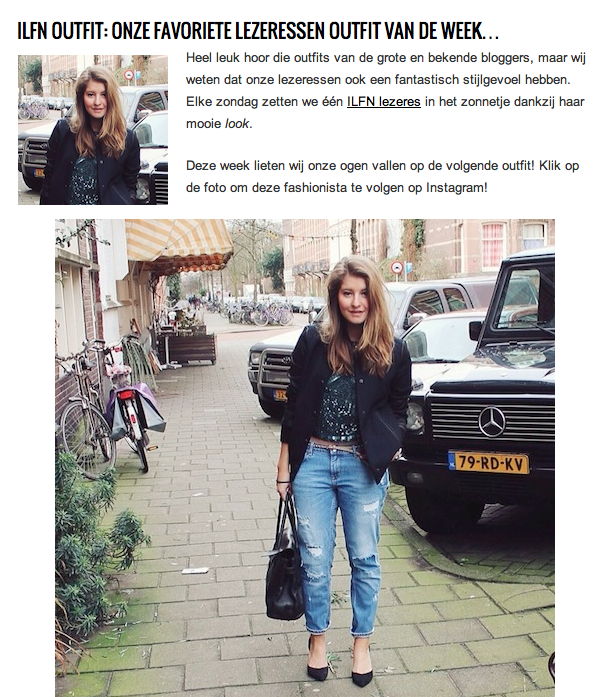 I was featured on Holland's biggest fashion website I Love Fashion News for ILFN Outfit of the Week! Check it out here! Hi guys, Tell me.. How was your Valentine? Boring, romantic, steamy or just drunk? Valentine's Day is supposed to be the day you do something romantic together with your date, boyfriend or secret crush. However, I do not like those traditions. I consider Valentine's Day a day that you should put pranks on people. Like giving roses, with some hideous poem, signed off with 'Anonymous' or 'Signed, Guess Who?'. I spent my Friday night in Amsterdam together with my friend Jerry Lee, having a 'romantic dinner for two'. Of course, we couldn't resist the Valentine's menu; oysters first, as main a lobster and last but not least a delicious chocolate cake. And obviously, there was wine.. ;-). Somehow, we spotted that night so many single guys and girls, hanging out with their group of friends seeking for a secret crush. Jerry Lee's and I only secret crush was the cocktail shaker at Bo Cinq in Amsterdam. Well kind off. He just figured out the cocktails that suited us best. That was enough for us ;-). So please share with your ultimate Valentine's experience is.. I'm curious :-). Hi guys! I wake up with loads of things to do, including girly stuff. I do not consider myself as a girly girl. However in case of prom, my girly sides comes up (that was a lot of girly in a short period of time). So this Friday I have my prom/gala of my uni in the south of Holland in some fancy cute castle. The first thing that came up in my mind was ,obviously, picking a dress. Well that worked out well. Unfortunately for you guys, I'm not gonna reveal the dress until the Friday itself (I like to keep it as a surprise). Though, a lot of other things has to be done. I'm in desperate need of a tan. However I kindly consider myself as the combination of Snow White and the dwarfs (feel closer to the dwarfs somehow with my 1,59 m), I need to get a tan. It makes you look skinnier, taller (need that one) and everything looks better on you. And it gives me a summer holiday feeling when I have a tan like I've spent three weeks in the Bahamas. Than the hair cut.. Well I will go to the hairdresser on Friday itself, though, I don't know what to do with my hair yet, so please share any of your thoughts with me! Outch, this is getting to girly for me. However, my 'Leather on Leather' outfit compensates that somehow. Enjoy your day sweet followers! LOVE IT! The new campaign of Isabel Marant with Daria Werbowy for S/S 2014!